Written by Janet Choi on February 12, 2015 . But Nightclubs, comedy clubs, is where comedy is born and where comedy, standup comedy, truly lives. Going back to Abraham Lincoln, who was probably America’s first comedian, Americans have enjoyed gathering at night in small packed (and once smokey) rooms, drinking themselves a bit numb and listening to each other say wicked, crazy, silly, wrongful, delightful, upside-down, careless, offensive, disgusting, whimsical things. One million dollars. That’s a lot of money. Really too much money. I’ve never had a million dollars all of a sudden. and since we’re all sharing this experience and since it’s really your money, I wanted to let you know what I’m doing with it. People are paying attention to what’s going on with this thing. Telling stories and expressing your voice doesn’t mean you lose sight of your point. As much as Louis seems to write off the cuff and share personal thoughts, every one of his emails has a purpose — whether it’s to notify his fans about an HBO special or to publicize his first feature film. 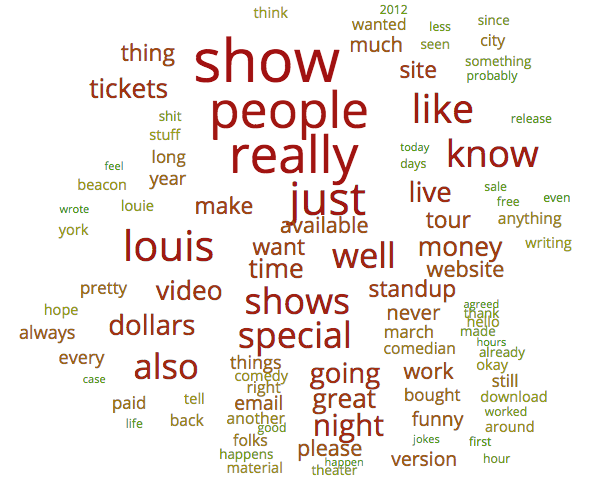 In fact, when The Atlantic’s Adrienne LaFrance ran Louis’s emails through a document analysis tool, she found that “his messages are overwhelmingly characterized by promotional language.” Words that kept reappearing included: special, tonight, tomorrow, tickets, ticket, buy, and price. Here’s a word cloud I made with his emails: Marketing and business-y language is almost always immediately off-putting, which is why the simple act of being treated and spoken to like a real person can be so remarkable. Personality, voice, tone, and a dose of self-awareness are what mediate that repellant sales-y pitch. Deviate from everyday email scripts. Hello many people mostly concentrated around the New York area. How’s that for personal? Actually that’s how I greet everyone I say hi to even in person. Better to be correct than accurate, I never say. Okay. That’s it. I have to do some laundry now. Take care of yourself and don’t be a jerk to people. If you look at this next email from far away, it looks like any regular email message, with a greeting, body, closing, signature, and postscript. My first feature film, Tomorrow Night, is available now on louisck.com for 5 dollars. You can go there now and get it. You don’t have to. But you can. And you may. Louis CK if you are not a person and instead you are a dog or you are 2 whales and a wooden box, then please disregard this message. Because I don’t want dogs or whales and boxes to watch my movie. This ps is now longer than the original message. The conventions and customs of email writing are also clichés, where you might have the most room to riff. When you look at your marketing emails, can you identify a personality or voice to them or are you filling in the blanks of stock marketing scripts and email templates? Be relevant by setting up segments and expectations. That’s the basic news of this email so go ahead and go watch the show. You’re getting another email from me now which is crazily long. So I sent it separate. If you don’t enjoy long winded, unedited coffee-addled… while my kids yelled at me to take them sledding-written material, then skip the next email. thanks. 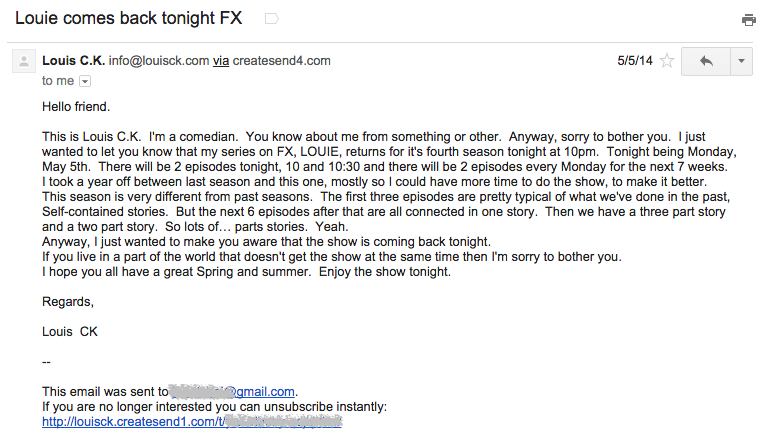 Louis’s emails look entirely manual and DIY, with little to no formatting — not even bold or italics. It’s just text with the occasional link. 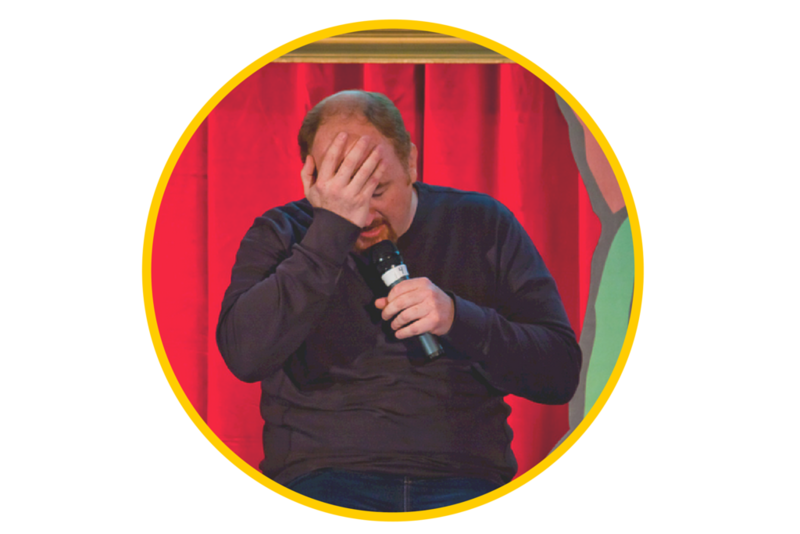 Emails don’t land in your inbox as being from “Louis CK Marketing Team” but “Louis CK.” Even his closing signature isn’t automatic, signing off with variations like: “Louis CK”, “Louis ck”, “Louis C.K.” It’s like he sat down at his computer, opened up a new window in a regular email client like Gmail or Yahoo, typed up a message, and hit send — even though he’s using an email service provider that manages marketing and bulk emails (and complies with CAN-SPAM by providing that all-important unsubscribe link). Simple layouts often perform better, especially in contexts where you’d like readers to respond or click through to take an action. This casual look plays a vital part in building trust and an agreeable frame of reference — helping your marketing emails look like what your friends send. If Louis puts the very same text into a fancier HTML template, it would be like he was communicating a different message. 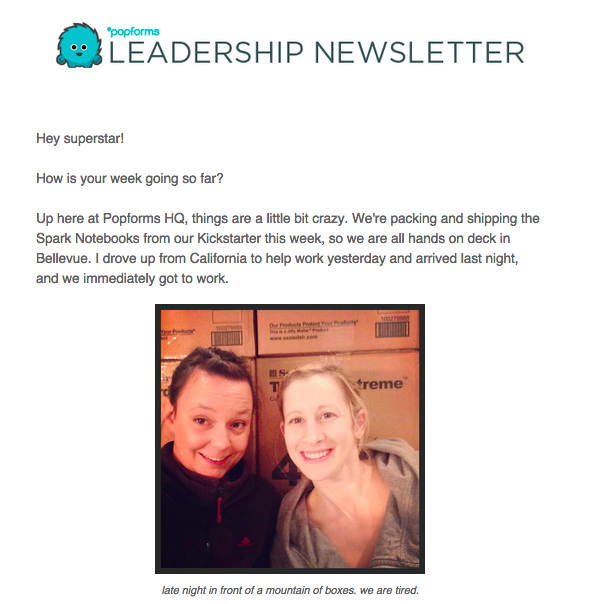 Popforms has a great newsletter that always feel warm and personal, thanks to the efforts of co-founders Kate Matsudaira and Kate Stull. They share firsthand stories of how they’re building their company, from how they grew their email list or what their progress is on their Kickstarter project — letting you in on their process and increasing how invested you feel in what they’re doing. At the end of 2014, everyone at Customer.io received gift cards for Watsi, a direct funding platform to pay for medical treatments and healthcare for those in need around the world. 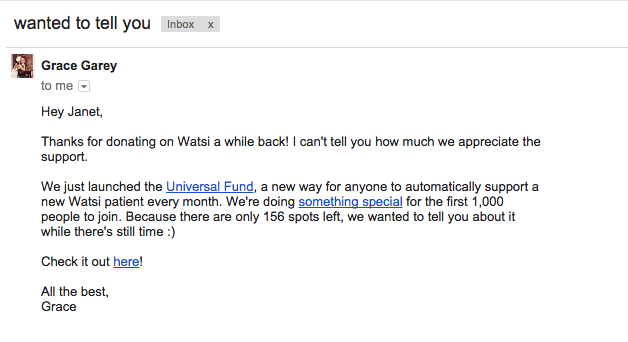 The Watsi team send out their thank you email as well as this follow-up in plain text — which felt in line with the nature of the donation and spirit of the organization. Here, this format and personal feel convinced me to click through. Email preheaders, closings, and postscripts are great places to inject some personal detail. I’m not even sure who is behind the This American Life newsletter, but I always love the short personal postscript at the bottom. The most recent postscript — “This update edited with one week left before moving out of NYC. Quick! What shouldn’t I miss as a resident?” — made me want to reply.